It may mostly be based in fiction, but the real life impact of fandom is anything but fantasy. 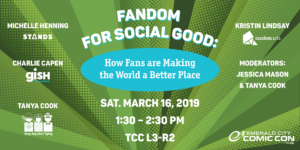 That was the topic of Emerald City Comic Con’s panel “Fandom for Social Good: How Fans are Making the World a Better Place.” Four panelists spoke about their efforts – Charlie Capen: Vice President of Gish, Michelle Henning: CEO of Stands, and Kristin Lindsay: Random Acts’ Outreach Officer. Jessica Mason: writer for The Mary Sue, and Tanya King: Researcher at Always Keep (Nerd)Fighting, moderated the panel, and it was a blast. The panelists represented three angles to fandom engagement. Gish uses games and puzzles to raise funds for charities, Stands sells fandom related merchandise, and Random Acts take more of a traditional role of a non-profit who engages with multiple sources, including Gish and Stands. They began by each going over what the individual organizations are currently working on. Charlie talked about the GISH registration operation to save the Saola, or “Asian unicorn”. Next, Michelle discussed Stands’ “Run Pads Run” campaign. This campaign is supporting the Random Acts Board Member Genevieve and Jared Padaleckis’ fundraising goal for the Boston Marathon in aid of Dream Big! (a charity that supplies equipment and fees to underprivileged girls taking part in organized sports). She also talked about the charms Stands is selling this year, introducing a new one each month by a different actor from Supernatural, with proceeds supporting a their charity of choice. Finally, Kristin shared Random Acts’ #RANoHungryChild efforts, including some statistics on food insecurity in America. Kristin highlighted the Little Rock food bank project as one example of the work we are doing to fight childhood hunger. Somewhat looming over the panel was the overarching presence of Our fearless leader. Because Misha founded Random Acts and GISH and has worked closely with Stands, he was mentioned not infrequently. Therefore, Tanya suggested making a “swear jar” of sorts for the duration of the panel. By the end Charlie was out almost ten dollars. This panel allowed Random Acts as well as Stands and GISH to showcase all of the good they are doing in the world, due to and in collaboration with fandom. Their hope is that by discussing what strides they’re making, it will encourage other fandoms to step forward and #GetKind within their own communities and world. 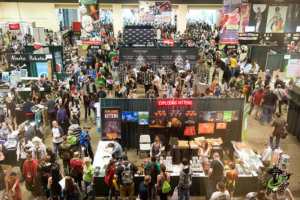 A huge thanks to Emerald City Comic Con, Michelle, Charlie, Jess, and Tanya! Want to see Random Acts in person? Check out what events we are going to be at here.